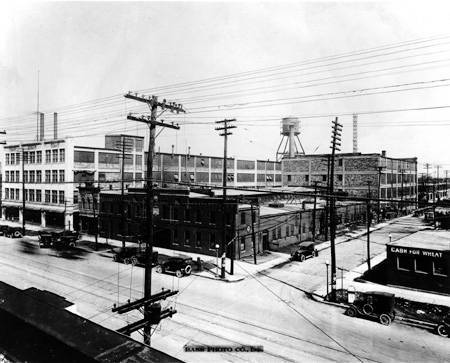 The Cole Motor Car Company property as it appeared in 1920. This view, the corner of Washington and Davidson Streets, is from the southeast, as you would see it today traveling north on I65. Image: Bass Photo Co. Collection, Indiana Historical Society. Joseph J. Cole and his son took their first shot at building a car in 1903. They called it the Rockford, the name of the Illinois town in which they developed their four-cylinder touring car. But the Rockford failed to gain much traction, so they opened a Rambler dealership instead. 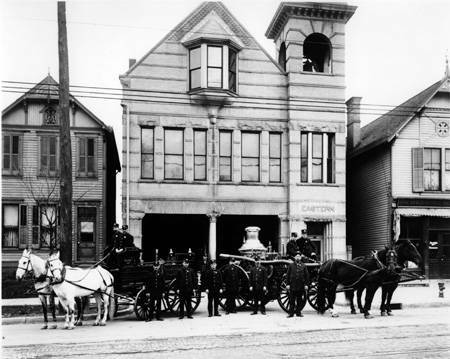 A year later, Cole bought into the Gates-Osborne Carriage Company of Indianapolis and in short order changed the name to Cole Carriage Company. In 1909, his company was reorganized as Cole Motor Car Company. It became an Indianapolis pioneer in the development of the V8 Engine and a builder of quality luxury cars for the next fifteen years. 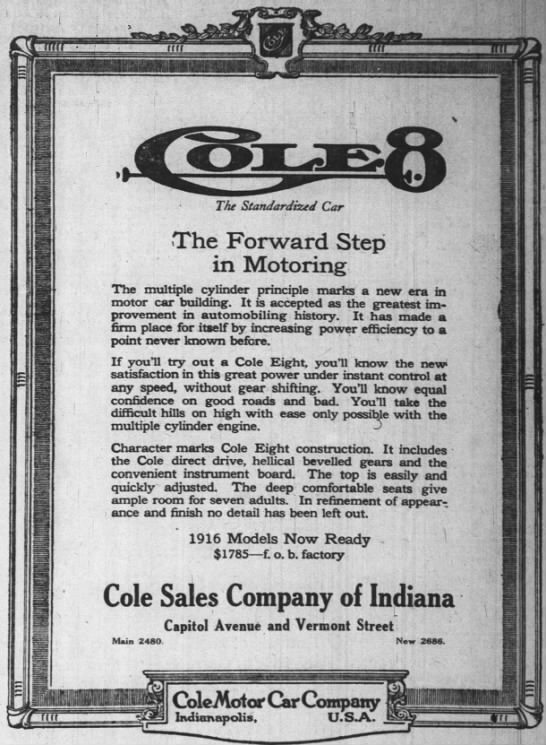 Newspaper advertisement for the Cole 4 and Cole 8. Source: Indianapolis News, May 22, 1915. Advertisement for the Cole 8, 1916 Models. Source: Indianapolis News, August 14, 1915. 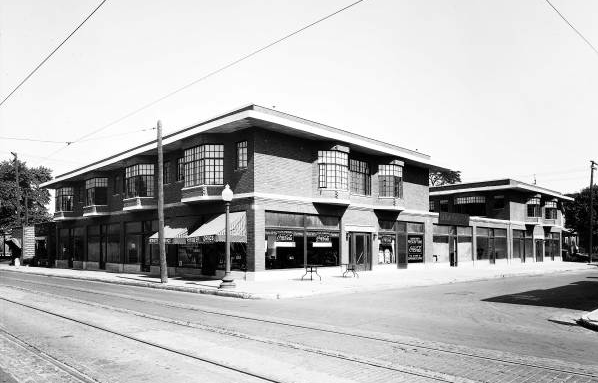 Eager to compete with the Cadillacs of the world, they needed more than the small brick building they rented at the corner of East Washington and Davidson Streets—the one that had been built as a stage coach shop turned livery stable, until Cole moved in. 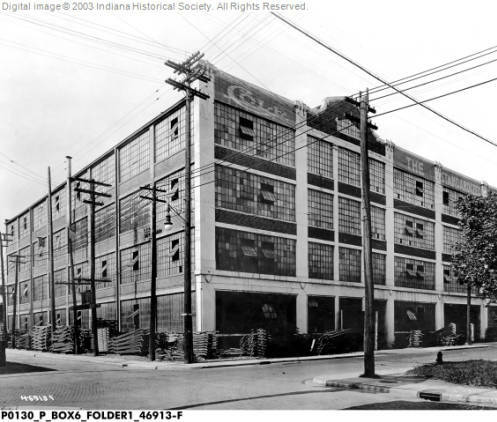 In 1911, Joseph J. Cole bought the old building and constructed a $100,000 auto manufacturing plant behind it—a 4-story reinforced concrete plant of 66,000 square feet on the southwest corner of Market and Davidson. It became the first in a complex of Cole buildings facing the 700 block of East Washington Street, just east of the railroad crossing at College. The Cole Motor Car Company expanded again in 1913, 1919, and 1922. 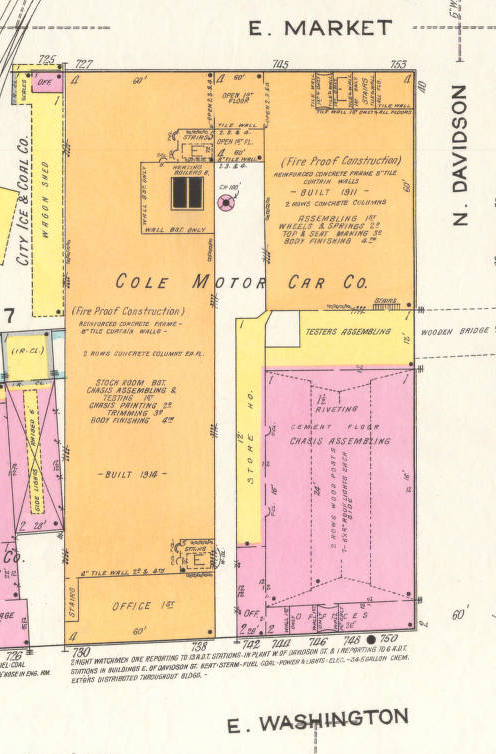 Footprint of the Cole Motor Car Building in 1915. 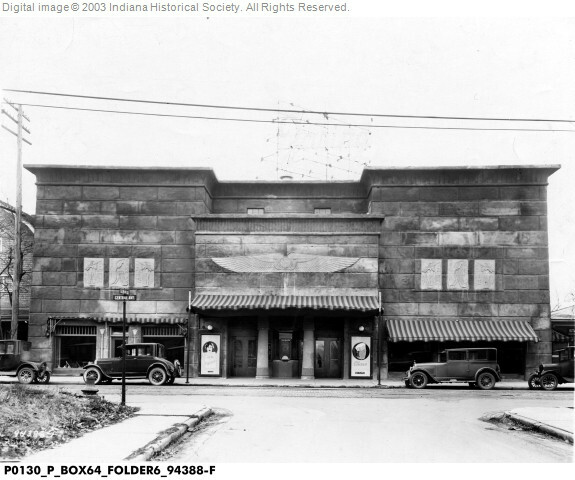 Image: Indianapolis Sanborn Maps, 1915, IUPUI Digital Collections. The Cole Motor Car Company Building facing Market Street, just west of Davidson, as it appeared in 1910. Image: Bass Photo Co. Collection, Indiana Historical Society. In 1920, Mr. Cole bought a piece of land at 4909 N. Meridian Street and built himself a mansion. But the recession falling on the heels of World War I and new competition in the luxury car market had his business faltering dramatically within a few short years. The Cole Motor Car Company ceased all production in 1924 and folded a year later. Cole died of an infection before liquidation of the company was complete. 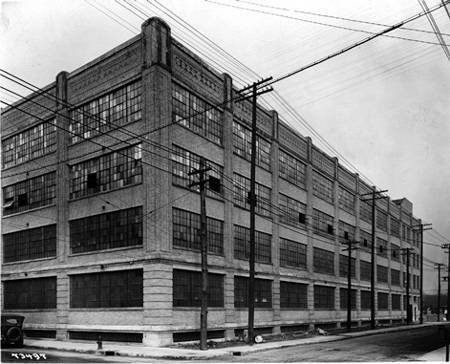 The Cole Motor Car Company complex spent the next 45 years as rental space for other businesses. Early tenants included the Industrial Electric Company, Peoples Motor Coach and Washington Auto Sales. The Cole Building itself, the main plant presently known as 730 E. Washington Street, hosted a wide range of enterprises. In the 1930s, they included Mack International Motor Truck and Advance-Independent Electrotype. In the 1940s, it housed Best Universal Lock, National Map, and United Motors, while Banquet Ice Cream settled in next door at 750 E. Washington. In the 1950s and 1960s, the Cole Building added tenants like RCA Victor Division, Jenn Air Products and the National Cancer Society. Joseph Cole’s building remained useful–and a monument to the role Indy played in the early auto industry, but other structures in his complex began to fall by the wayside. The original Cole Motor Car Company building, the old livery stable at Washington and Davidson was torn down in 1962 to make space for parking. 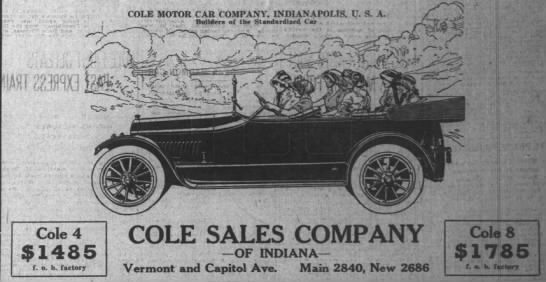 A story in the Indianapolis Times quipped that Cole Autos were unlikely to be found in the lot. But the company’s founder had maintained a presence on the property, nonetheless. Joseph Cole’s grandson had an office in the former plant, still standing behind the spot where the old building stood and served as President of the new Cole Motor Car Company, an industrial real estate leasing and Management Company managing the migration of all those tenants in and out of the building. The Cole Motor Car Company addition on the northwest corner of Market and Davidson Streets as it appeared in 1921. It now houses the Marion County Processing Center. Image: Bass Photo Co. Collection, Indiana Historical Society. A future tenant, the biggest one yet, was waiting in the wings. E. C. Seitz founded Indianapolis-based Service Supply Corporation in 1948. He started humbly enough, in a 500 square foot, Nineteenth Century warehouse at 458 Virginia Avenue, but his company, a distributor of industrial fasteners, was growing rapidly and looking creatively for room to expand. So in 1969, Service Supply moved its nuts and bolts into the old Cole plant and they took up the entire building. Almost ten years later, they acquired a ten-story structure to the west at 603 East Washington Street, the former Spink Industrial Building, and spent $1 million to transform it into the company’s corporate headquarters. That expansion cemented Service Supply’s reputation as a leader in revitalizing old industrial buildings in downtown Indy. By 1981, Service Supply Co. had become the largest supplier of industrial fasteners in the United States and had acquired more than one million square feet of warehouse space in ten buildings, all in or near the mile square. 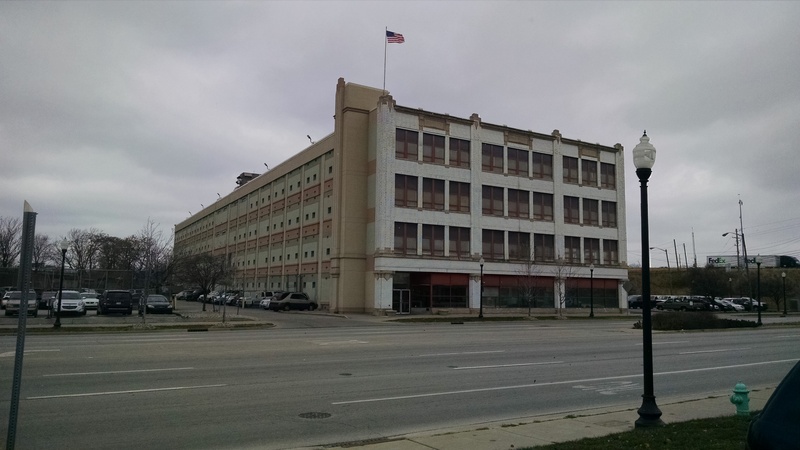 They also managed to be good stewards of all those properties: In 1983, the Cole Motor Car Building was listed on the National Register of Historic Places. The “House of a Million Screws” continued to grow, but needed technology and economies not available in a cluster of old buildings. 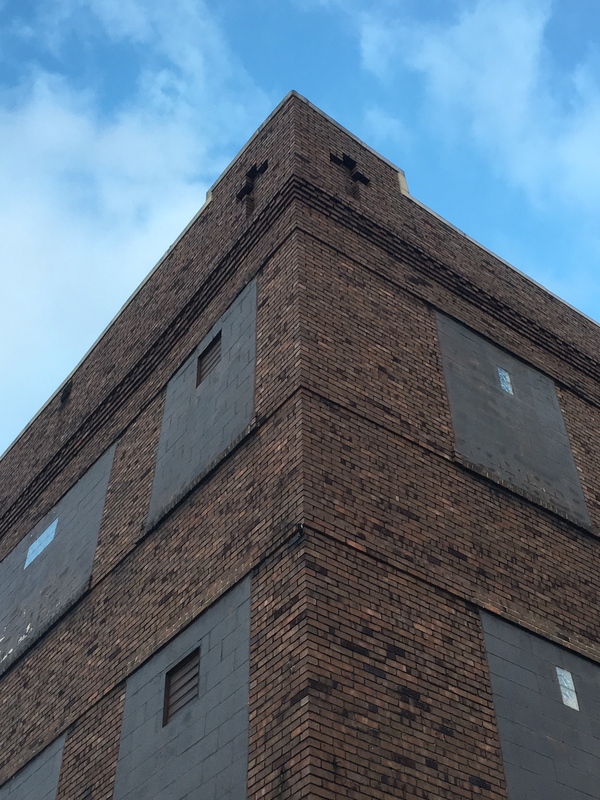 At the same time, the City of Indianapolis approached the firm with a proposal to buy two of their warehouses in the 700 block of E. Washington Street—what remained of the Cole Motor Car complex. The Cole building was the perfect structure to convert into a 670-bed city/county jail expansion because it was just seven blocks from the courthouse and had ideal ceiling heights and spacing between columns for installing pre-fab jail units. It was also bordered by railroad tracks and an interstate highway, which meant there would be no neighbors to complain about a jail next door. So in 1996, Service Supply left the Cole Buildings and moved into a new location on West 86th Street, where they could consolidate operations under one roof, providing improved logistics for a large warehousing and distribution center. That freed up space for the jail expansion; Marion County Jail II, opened a year later. The Cole Motor Car Building has housed Marion County Jail II since then, filling a vital role for the overloaded Marion County Jail system. Corrections Corporation of America (CCA) manages the facility, a role that includes transporting inmates to and from court on a daily basis, serving the basic needs of the inmate population, and providing them with work search training and opportunities to perform community service. But Marion County Jail II has come on hard times lately, and authorities report that CCA will no longer have a role in managing it when its ten-year contract concludes at the end of this year. The building will eventually have no role, either. In August of this year, Mayor Joe Hogsett announced plans to build a new criminal justice center on the near southeast side of the city, which will include a new jail. All of that means the city will likely, once again, roll out a new mission for the historic Cole Motor Car Company building.